Have you been neglecting some old and forgotten areas of your home? 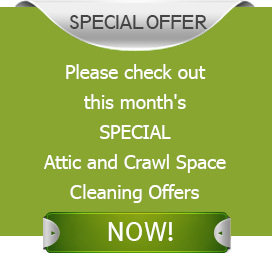 When was the last time you stepped into your attic and crawl spaces for cleaning? You have stacked loads of things, your memories, your sports stuff, your hunting equipment and so much more. The dingy area has wiring, ducting and insulation that need to be protected from pests, microbes and small animals. These living creatures may look innocent but they are health hazards. The hungry living beings can create chaos and huge amount of damage in your attic and crawl space and can turn your normal life, upside down. Do you want this to happen? Definitely not! We can help you here. At Quartz Solutions we have the latest equipment and skilled teams to help you identify these creatures and even drive them out of their hiding places, leaving the area safe for you to use! Contact us, now, we are offering a free inspection! Termites, yellowish colored ant like, bite hard and nasty, and they love to gnaw away at the wooden treasures you have stacked in your attic and crawl spaces. Rodents, bats, mice, have insatiable stomachs and super sharp teeth. They love to eat away insulation, ducting and wiring. Animal teeth marks poke holes creating leaks in the ducts and this leakage starts to effect the insulation. The temperature control inside the home is destroyed, and extra cooling or heating needs load of extra electricity. These animals have smelly feces and urine and many infections can be caused by this. This is one of the main reasons for causing protozoan diseases. Leaking ducts lead to the growth of the unhealthy mold and mildew which is detrimental to the foundation and woodwork of the home. 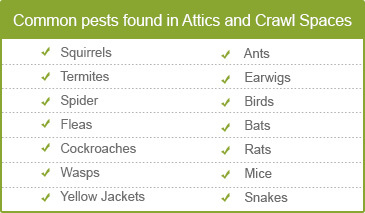 Quartz Solutions will be a blessing in disguise for your home and we will help search out pests and animals, scampering in your attic and crawl spaces. We can find them out and drive them out of your homes in no time. We promise to examine and inspect the deep and dingy areas of your attic and crawl spaces and analyze it for broken ducting, pests and rodents, pest infestation and vapor piping. We can sense the presence of Radon, the dangerous gas in your crawl spaces. The assessment of the attic and crawl spaces is executed in a faultless manner and once the area is evaluated systematically, a careful plan for clean-up and future maintenance is decided. The inspection is carried out for no cost. Why don’t you avail it, now? Everyone wants a fair deal, and Quartz Solutions is the best and most reasonable cleaning solution for you. We offer a free inspection and perform the cleaning procedure within your limited budget. Want to see the beauty of the night shining bright with the help of quaint gas lamps lighting both sides of silent streets? Head to this exquisite borough ‘township’ called Glen Ridge in Essex County and set up base the same way as the odd 7527 people have. While you enjoy the quaintness of the town, we, Quartz Solutions, promise to take care of the cleaning of your attic and crawl spaces, in no time. Call us at 973-536-1013 Quartz Solutions Attic & Crawl Space Cleaning Services in Glen Ridge, Essex County, NJ (07028 zip code) and avail the free inspection we offer. Just a quick line to thank Josh and his team for cleaning up the attic mess, the roaches, and all those creepy crawlers. Brilliant job guys!